Watercolour nails. For a moment, they were all the rage a few years ago and though I have tried once or twice in the last seven years, they are just nails I never really do even though I do think they are pretty. Maybe I just think the idea of diluting nail polish is blasphemy, but when I realized I had two of the Born Pretty Blooming Nail Polishes, I figured it was time to try this again and add some extra flair if I could! If you look at the description of the Blooming Nail Polishes*, it's actually not immediately clear what they are and when I chose them for my press package, I honestly thought they were magical polishes that somehow "bloomed" on the nail to mimic watercolour paintings. There is a reason why my right hand is total garbage and that is because I do trial runs on THOSE nails and lemme tell ya, they did not go well the first few tries! Eventually, I got the hang of it and the key thing to take into account with these almost watery polishes is that the idea is not to have opacity, but to "dribble" varying concentrations here and there to get that more artistic look. Watercolour polishes look best on top of white polish, so I started off with two coats of Prim + Proper in Fresh Powder* and even though it was still a bit streaky, I didn't bother with a third coat because I was going to drench it with a top coat of colour anyway. I started with the pink shade and just layered randomly in every direction over the nail polish and then followed up with the blue. If I wanted to intensify the colour, I just globbed on more layers. I felt like I wasn't quite done yet so I went Bohemian and added some feather water decals also from Born Pretty. I added some shiny top coat and I was done! Have a great day everyone and be sure to check out: Renee, Trysh and Eithne's blog and social media channels for their "Nails I Wouldn't Do" manicures! 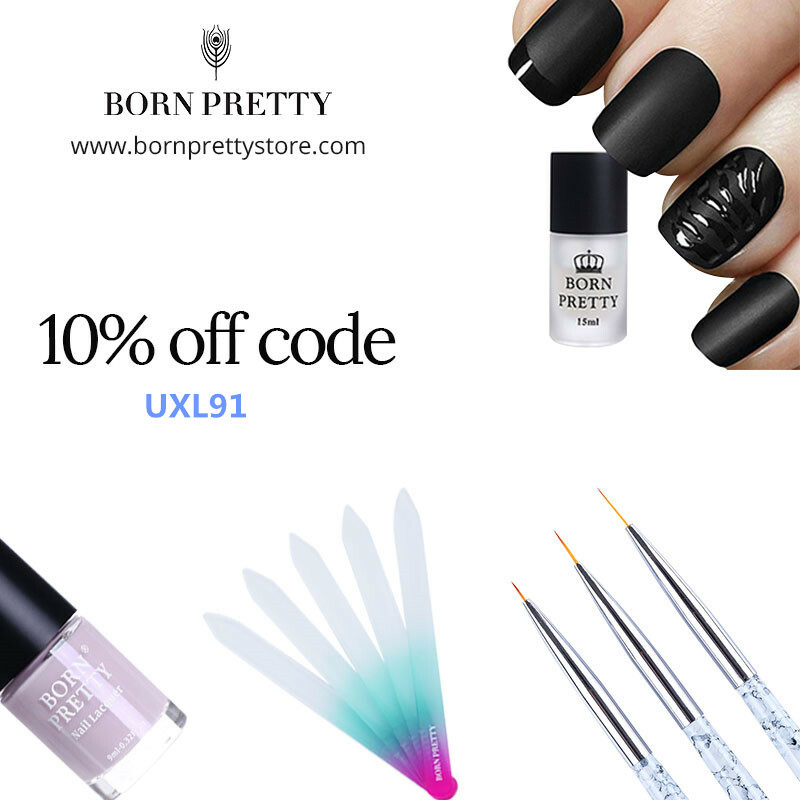 And of course, feel free to use the code UXL91 (non-affiliate) to save 10% off your Born Pretty purchase! SKINCARE | My Top 13 Sheet Masks from 2018!